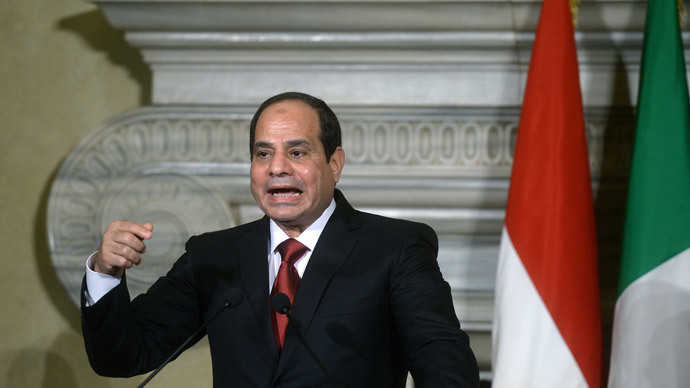 Egyptian President Abdel Fattah el-Sisi is calling for a United Nations resolution mandating international intervention in Libya after Egypt bombarded IS targets in Libya following the apparent beheadings of 21 Egyptian Christians. "There is no other choice, taking into account the agreement of the Libyan people and government and that they call on us to act," Egyptian President Abdel Fattah el-Sisi told France's Europe 1 radio in an interview aired on Tuesday. Asked if it would recommence its own action: "We need to do it again, and all of us together." Egypt launched an aerial assault on IS positions in Libya on Monday and called on the United States and Europe to participate in an international coalition in the North African state. Egypt is rapidly attempting to forge an international coalition as IS continues to make inroads. Sisi spoke with French President Francois Hollande and Italian Prime Minister Matteo Renzi on Monday about the deteriorating situation in Libya. He also dispatched his foreign minister, Sameh Shukri, to New York to consult at the UN ahead of a terrorism conference beginning on Wednesday in Washington. Meanwhile, the Egyptian leader called on militias to hand in their arms but urged weapons to be supplied to Libya's internationally recognized government, based in the eastern city of Tobruk after rivals seized power in Tripoli. "What is happening in Libya is a threat to international peace and security," said Sisi on Monday, speaking for a nation mortified and enraged by a video showing Egyptian Coptic Christians being led along a beach, purportedly in Libya, before being executed by Islamic State (IS, formerly ISIS) members. The Tobruk government has already asked for the lifting of an international arms embargo to help it take back control of the country. In Monday's attack on Libyan territory, Egypt said IS training camps were targeted "to avenge the bloodshed and to seek retribution from the killers," Egyptian military statement said, as quoted by AP. "Let those far and near know that Egyptians have a shield to protect and safeguard the security of the country and a sword that cuts off terrorism." The Egyptian military sent US-made F-16 fighter jets to target alleged IS sites in the eastern Libyan city of Darna, according to Egyptian and Libyan security officials who spoke on condition of anonymity, AP reported. Libya saw a multinational intervention in the 2011 Libyan civil war that led to the death of Libya strongman Muammar Gaddafi. The 7-month military intervention in Libya (March 19-October 31, 2011), carried out by a US-led group comprised of mostly Western governments, ended soon after Libyan strongman Muammar Gaddafi was captured by a mob and killed on the street in Sirte, which just happened to be Gaddafi’s birthplace. Since the Western intervention in Libya, the country has remained on the cusp of collapse, pulled as it is between internal forces (including the Islamic State), which the power vacuum has created. On September 11, 2012, following the release of the anti-Muslim video, Innocence of Muslims, the US diplomatic compound in Benghazi came under attack by over 100 gunmen, leading to the death of US Ambassador J. Christopher Stevens and US Foreign Service Information Management Officer Sean Smith, as well as two CIA contractors. Since August 2014, Libya, which boasts Africa’s largest oil reserves, has been ruled by two competing governments, a scenario that leaves open the question as to who owns Libya's oil exports, worth more than $10 billion a year.